The church needs to reach out and embrace the sick, not just see them as poor people in need, but as ones anointed, most intimately, with the power and love of God, with great first hand knowledge of the presence of God and wonderful spiritual gifts to share with the wider community; if only it was genuinely interested. 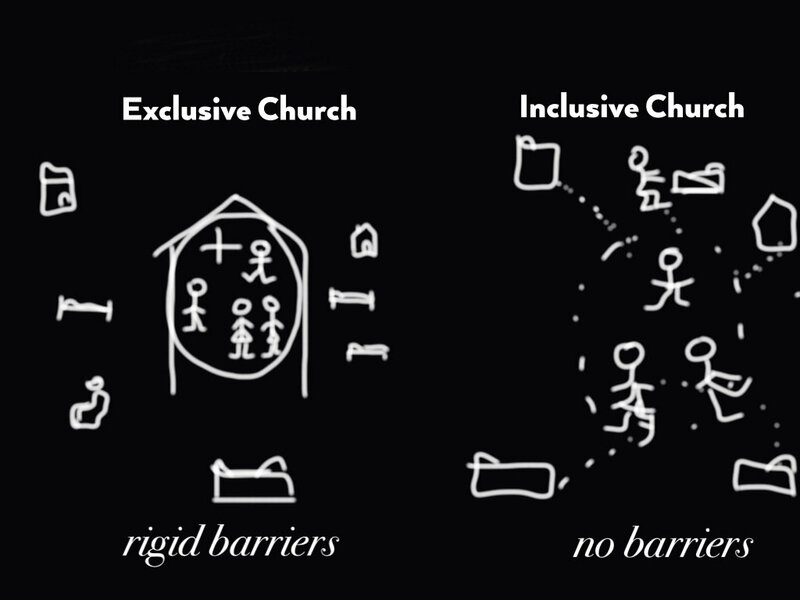 There may be a focus on access to church buildings for people who are disabled, but we say this is not enough, for access does not mean inclusion, especially when too ill or disabled to attend church or integrate in the normal manner. Each church needs to ask itself, how are we inclusive and connected to the long term sick and the housebound of the parish in particular ? Are we just playing lip service, or do we genuinely want to engage in meaningful dialogue and spiritual direction with the whole parish and especially with those who are invisible members of the community, yet nevertheless exist in prayerful communion with God ? We suggest that the church needs to think again about how inclusive it is, in reality, to those too sick or ill or frail or disabled to get to church. For from our own experience, we have been part of one church who held us at the centre of its family and another, more interested, apparently in the pomp and ceremony and image of the church, in ritual and visitors, rather than a genuine reaching out and involving its own, closer, housebound community. A church, sadly, who simply does not know how to listen, how to love, how to genuinely care for all members of its flock, even when asked to do so. The diagram of church illuminates the issue. The first picture appears to be a solid church community within the boundary of the building, but outside, the flock are neglected and disconnected. The second picture may not appear like a substantial church. It has no solid walls, the people are reaching out and interacting with everyone, giving and taking. It may look more insubstantial, but it is flexible and inclusive. It is a true church. This is how we see the traditional, institutional church. Ministry is not about a building, nor pomp and ceremony, nor about visibility. It is about genuine outreach, humility, compassion, genuineness and unconditional love, often found outside the traditional model of a church. We hope and pray that we on the edge of society and healthcare and physical community, can nevertheless find God through the Holy Way website, our own virtual cathedral, reaching out to spread Gods Holy Word and Love to those unable to be part of normal church ritual and spread the word that you are not alone.